I’m a vegetable gardener that makes intensive use of the space in my 4 foot wide raised beds. What do I mean by intensive use, I mean that I pay more attention to the spacing between plants (see HG16 – Planting Dates for Vegetable Crops in MD) and no attention to the distance between rows. I’ll use snap beans and beets as examples. For snap beans, I plant 3 rows in my beds with seeds spaced 2 inches apart. In a 5 foot long space, this gives me 90 plants, more than enough for myself, family and food bank. For beets, I plant 4 rows with seed about 3 inches apart, which gives me 80 plants. Add to this the fact that I succession plant a lot of my summer and cool season in blocks like this and my garden is very productive. There are 3 main ingredients to this kind of intensive gardening, but since it’s fall, I’m going blog about soil improvement, since soil provides not only support for the vegetables but also holds the water and nutrients which are necessary for optimal yield. Fall is a great time to improve your soil since you may have areas in the garden that are not planted. The first task to complete when improving your soil is to do a soil test, if you haven’t done one in the last 3 to 5 years (Univ. of MD’s Home and Garden Information Center (HGIC) recommendation). The results from your soil test will tell you your soil’s pH, nutrient levels (phosphorous, potassium, calcium, magnesium and other micro nutrients, nitrogen is not tested for because it is transient in the soil) and amount of organic material (OM) in your garden. The example below is from the Univ. of Del. soil test lab. In the results from the soil test, the Univ. of Del. tells the client the specific amount of lime to add to bring the soil’s pH range into the 6.2 to 6.8 that vegetables prefer. It also tells the client what nutrients need to be added, when to add them and how much to use. I would note that these recommendations are for commercially available inorganic fertilizers and that organic gardeners would have to convert these recommendations for applicable levels of organic fertilizers. Help with this conversion is available from the friendly folks at HGIC. 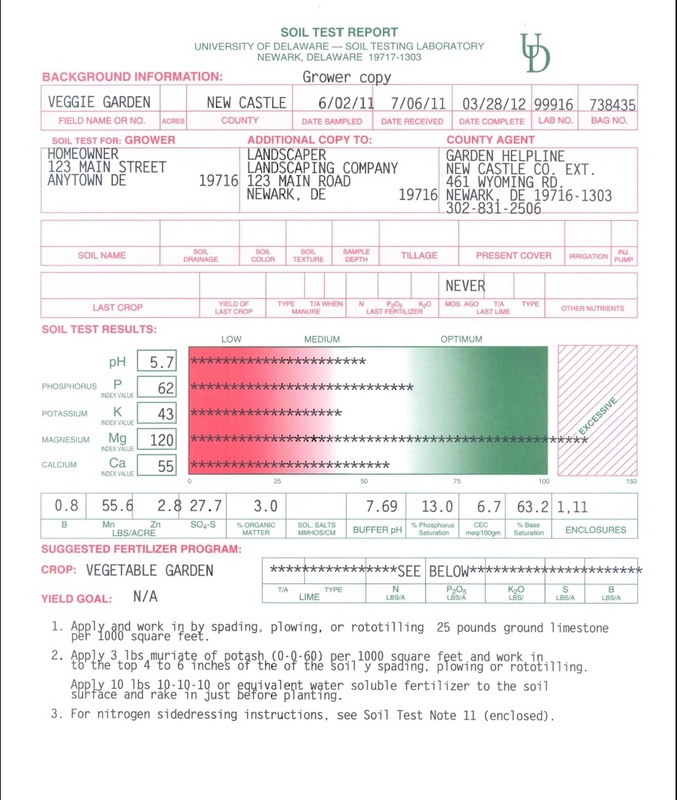 Just scan a copy of you report, email it to HGIC using the “Ask the Experts” button on the GIEI page and give them the analysis (N-P-K on the container) of your choice of fertilizer or allow them to choose from the wide array of organic choices. One caveat I would add at this point is that nutrients need to be in water soluble form in order for plants to take them up. Some organic fertilizers are not water soluble and have to be acted on by soil microbes to convert them from an organic form to a water soluble form. Thus, when the soil is cold in the spring and fall, it is advisable to select a water soluble organic fertilizer (e.g. blood meal a source of water soluble organic nitrogen). The second soil improvement task is to add additional OM to the soil. (HGIC recommends adding 6 inches of OM to new gardens and one inch annually to established gardens.) This can be accomplished in two ways, either by adding compost or other OM or by growing a cover crop which can be incorporated into the soil and allowed to decay. Both of these techniques add OM to the soil, which becomes a residual source of nutrients available to plants as soil microbes convert the organic forms of N-P-K into water soluble forms. The goal for my intensively planted garden is to keep the OM content of my soil to a level greater than 5%. Besides acting as a reservoir of nutrients for the plants, the humus which results from the decomposition process increases the water and air holding capacity of the soil. It accomplishes this by “glueing” soil particles together into larger clumps or aggregates which creates micro pores for holding soil solution containing nutrients and macro pores which allow the soil to drain and introduce air into the soil. Soil with good structure, lots of macro and micro pores and containing adequate nutrients, will result in optimal yields. So this is my general formula for soil improvement. It works wonders in my garden and can do the same for you. If you would like to hear more on soil improvement, I am making a presentation tonight (Thursday, Oct. 1 at 7 pm) entitled “Better Yield Through Better Soils” at Miller Library in Howard County MD. Please phone 410-313-1950 to register. I just saw this posting, unfortunately 2 days too late to attend your presentation. I live in Rockville MD and have been gardening for 20+ years. I just received my soil test kit yesterday from University of Delaware and will send it off once the soil dries from the rain of the past week. My question to you concerns cover crops. I have never planted a cover crop and want to try this year. I have 4 raised beds and also a high concentration of plants within them. This year I grew tomatoes, peppers, crookneck & butternut squash, zuchinni, some herbs and cucumbers (that were destroyed by pests 😦 ). Do you have a recomendation for a cover crop(s) for raised beds? I read somewhere on the UofMD website that cover crops can also help rid the garden of pests – this year, for the first time in 20 years my gardens were attacked by cucumber beetles and squash bugs. I have a feeling they came from the soil I purchased for the beds last spring. Regardless of their source, if there is anything I can do this fall to lower the chances of getting them again I want to do it; so if you have any suggestions or if an particular cover crop will help, please advise!! Thanks in advance for any info you can provide!